Central Otago experienced significant employment growth numbers from 2001 - 2009. During this period FTE employment grew by 50%. However, in 2010 (the latest year for which we have data) the district suffered a loss of employment for the first time since 2000. The long term trend is still significantly better than for the wider region and for New Zealand. 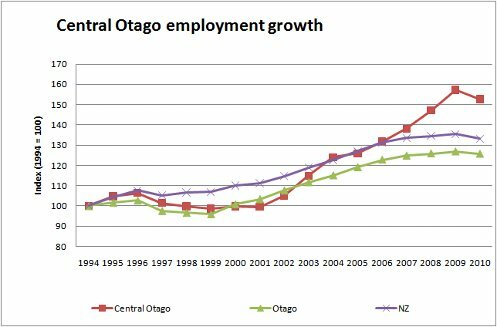 The graph shows employment growth for Central Otago District since 1994 as well as for Otago and NZ, all based on an index of 1994 = 100.